Welcome to the San Diego Immunization Program Website! Staff use link below to access the SDIB "WebInOut" Board and Emergency Communications Page. Measles is a very contagious disease. It spreads through the air by breathing, coughing or sneezing. It is so contagious that any child who is exposed to it and is not immune will probably get the disease. Measles develops seven to 21 days after exposure. Early symptoms include cough, runny nose and red eyes. The distinctive red rash usually appears one to four days after early symptoms appear. A person is considered contagious four days before the rash appears. The rash begins on the face and head then proceeds downward and outward to the hands and feet. It fades in the same order it began, from head to feet. Complications from measles are more common in children younger than 5 years old and adults 20 years and older. Complications can include diarrhea, ear infection and pneumonia. Death can occur from severe complications and the risk is higher among younger children and adults. There is no treatment for measles. Bed rest, fluids and fever control are recommended. People with complications may need treatment for their specific problem. All persons born in 1957 or after should have documentation of at least one dose of MMR (measles, mumps and rubella) vaccine or other evidence of immunity to measles. The Centers for Disease Control and Prevention (CDC) recommends two doses of the vaccine: the first at 12 months of age, and the second between ages 4–6 years. Persons should check with their regular source of health care to make sure they have had immunizations to protect against measles, whooping cough and other vaccine-preventable diseases. Visit the CDC’s measles web page for more information and links to resources about measles and measles vaccine. Meningococcal disease can strike in a matter of hours, but the after effects can last a lifetime. After effects can be life-changing and may include memory loss, limb loss, paralysis and organ damage. And those who lose a loved one to the disease have their lives changed forever. The County of San Diego Health and Human Services Agency is reminding our community that the best way to prevent some of the most common types of meningococcal disease is with immunization. The San Diego Immunization Program is sharing the resources below to help observe World Meningitis Day. They include social media messages, e-mail signature lines, and and a drop-in newsletter article. Please use these downloadable resources to spread the word about the importance of meningococcal immunization to your friends, family, co-workers and others in your community. 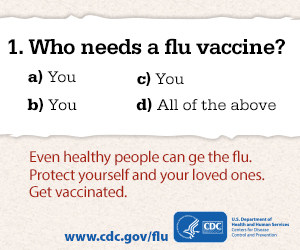 Flu vaccine is one of the best ways to get protected against flu. For more information about flu and flu season, please visit our Influenza Season 2018-19 web page. And for information about flu clinics at Public Health Centers and other locations, visit our Flu Clinics web page. The California Department of Public Health has updated its Recommendations for Prevention and Control of Influenza in California Skilled Nursing Facilities. Click here or on the link above to view and download the document. A survey conducted by the County Health and Human Services Agency (HHSA) revealed that 80.6 percent of San Diego County children between the ages of 19 and 35 months have received the recommended vaccines. The percentage is just above the federal government's Healthy People 2020 recommended target of 80 percent. The percentage of fully-immunized San Diego children in this age group is higher than the state (65.3 percent) and the nation (70.7 percent) Immunization percentages for California and the country came from the Centers for Disease Control and Prevention's VaxView. "We're ahead of California and the United States, and that is great news for our children," said Wilma Wooten, M.D., M.P.H., County public health officer. "The higher the vaccination rates, the lower the risks of children getting sick and infecting others." To read the rest of this County News Center story, including information on adolescent vaccination, please click here or on the red title above.. Hepatitis A Vaccine: Due for shot 2? The second dose of hepatitis A vaccine is due 6 months or more after the first dose. Ask your doctor or pharmacist if it's time for your second dose. If you do not have health insurance, please call 211 or visit 211sandiego.org to learn more about free vaccinations offered near you. 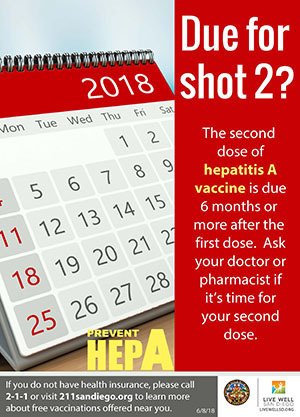 For more information about hepatitis A vaccine, the disease and the local outbreak, please visit the County's San Diego Hepatitis A Outbreak web page and 211SanDiego's Hepatitis A web page. The flyer pictured above is available in English and Spanish. Whooping cough is a very contagious respiratory tract infection. It usually starts with cold-like symptoms, such as a runny nose, low-grade fever and a mild, occasional cough. Since the early stages of pertussis can appear to be just a cold, it may not be suspected or diagnosed until the more severe symptoms start. After 1-2 weeks, severe coughing can begin. Fits of rapid coughing may be followed by a high-pitched whooping sound. Other symptoms can include vomiting and exhaustion. However, it’s important to note that not everyone with pertussis coughs or makes the whooping sound. In infants and children, especially those not fully vaccinated, whooping cough can cause serious and life-threatening complications. Half of infants 1 year of age who get pertussis are hospitalized. Of those babies, complications such as pneumonia, convulsions and apnea (slowed or stopped breathing) can result. Complications in older children and adults are usually less serious, especially in those who have received pertussis vaccine. The Centers for Disease Control and Prevention recommends the DTaP vaccine be given to children at 2, 4, 6, 15-18 months and 4-6 years. Preteens and adults should get a Tdap booster. Pregnant women should get a Tdap immunization in their third trimerster. Persons should check with their regular source of health care about these and other immunizations. The CDC’s Vaccine and Immunization website has more information about vaccine-preventable diseases like pertussis, and the immunizations to protect against them. For information about the Immunization clinics at County Public Health Centers and other locations, please visit the Immunization Clinic web page. Also, please see the information below about eligibility for shots at Public Health Centers. Children and adults who do not have health insurance (adults—only certain vaccines available). Adults whose health insurance does not include vaccines (only certain vaccines available). Persons 0-18 years who have Medi-Cal or are Medi-Cal eligible. For information about the law, please visit the California Department of Public Health (CDPH) ShotsforSchool website. The County of San Diego Health and Human Services Agency's Immunization Program conducts Random Digit Dialing (RDD) telephone surveys. Interviewers make phone calls to randomly selected phone numbers to assess immunization coverage rates as well as the knowledge, attitudes and beliefs about vaccines among San Diego County residents. Information provided by participants is kept confidential. Surveys provide valuable data to determine what proportions of children living in San Diego County are fully immunized. The information collected helps us plan programs to do a better job of protecting all San Diegans from vaccine preventable diseases. For more information, please contact the San Diego Immunization Program at 866-358-2966. Live Well San Diego is the County of San Diego's vision for a region that is Building Better Health, Living Safely and Thriving. Thriving calls for cultivating opportunities for all people and communities to grow, connect and enjoy the highest quality of life. To learn more, please visit the Live Well San Diego website. The Central Region Public Health Center (5202 University Ave., San Diego, 92105) and the VIP Trailer (3177A Oceanview Blvd., San Diego, 92113) also offer appointments for immunizations (including influenza) online, in addition to their walk-in immunization services. These locations have joined the South Region Public Health Center in offering this service. Click here to check out the Online Appointment System! Appointments cannot be scheduled by telephone.. Schedule for 0-6 years and 7-18 years of age. Schedule for adults 19 years and older. More information can also be found on the CDC website here. The County Epidemiology Program works to identify, investigate, register, and evaluate communicable, reportable, and emerging diseases and conditions to protect the health of the community. For more information about a variety of diseases, such as influenza and Hepatitis A, visit the Program's website here. The Immunization Action Coalition (IAC) has redesigned part of their website to provide a new look for the many great resources they have for the public. Called Vaccine Information You Need, it's a one-stop shop for getting the facts about immunization and how important it is to everyone's health. Click here or on the link above to visit this site. Resources for health care professionals are available by clicking the link at the top of the new section Vaccine Information You Need. And, as always, health care professionals can access those resources through www.immunize.org. Rotary International and a host of individuals and organizations worldwide are running a campaign aimed at promoting awareness of and support for polio eradication in general and Rotary’s End Polio Now program in particular. The campaign’s theme is We’re This Close To Ending Polio. Print ads and Public Service Announcements show photos of people doing the “This Close” gesture with their thumb and forefinger, and display type providing the context. See photos, join the campaign and read more at the End Polio Now site. The federal Centers for Disease Control and Prevention has an immunization website for parents. Called For Parents: Vaccines for Your Children, it features information about a host of topics of special interest to parents, including recording immunizations, finding old immunization records, vaccinations during pregnancy, what immunizations a child needs before traveling internationally, and much more! Visit the website here. This informative and educational website, created by The College of Physicians of Philadelphia, "explores the role of Immunization in the human experience and examines its continuing contribution to Public Health." The site features articles about the History of Anti-vaccination Movements, DIfferent Types of Vaccines, Ethical Issues and Vaccines, and much more. One article of note is an excellent overview of vaccine injury compensation programs in the U.S., including an introduction by immunization expert Paul Offit, M.D. Also featured are timelines showing the important events in the histories of diseases and vaccines, science and society and vaccine pioneers. There is a special section just for parents with features like Top 20 Questions about Vaccinations, Misconceptions About Vaccinations and the Development of the Vaccine Schedule. There are also special sections for educators and the media. Anyone interested in vaccines and vaccination will find a wealth of interesting and helpful information. Immunizations and Developmental Milestones for your Child from Birth Through 6 Years Old is a flyer on which you can keep track of the immunizations your child needs and also developmental milestones you see as he or she grows (such as smiling, talking, walking, etc.). This free tool is produced by the Centers for Disease Control and Prevention (CDC), American Academy of Family Physicians and the American Academy of Pediatrics. Download it by clicking here. Immunization Video PSA (click to play)! Vaccines.gov: Consumer-Based Immunization Information Website! The U.S. Department of Health and Human Services hosts an innovative website to help parents and other consumers learn about the most effective way to protect themselves and their children from infectious diseases and learn about immunization. Vaccines.gov brings together the best in federal resources on vaccine and immunizations to provide consumers with easy-to-understand health information specifically for their needs. A very large measles outbreak is currently occurring in the Philippines. We are asking for your help in getting this message about measles and the risk of travel to and from the Philippines out to a wide audience. Measles can be prevented with vaccination! For more information about the outbreak, and what it means for those who travel to and from the Philippines, please see this letter from the Public Health Officer. One in three people in the US will develop shingles in their lifetime. The federal Centers for Disease Control and Prevention (CDC) recommends that adults age 50 or older should get the new shingles vaccine. For more information, please see the CDC's Shingles Vaccination web page. Click here to view a County News Center video about the immunization exemption law, SB277, which went into effect in 2017. Video: How do vaccines work? Please click here (and scroll down when the web page appears) to see a video on how vaccines help protect people from diseases. The video was produced by students at Carrington College. The video is part of an interesting and informative website called Everything You Need To Know About Vaccines, also produced by the students. This decision involves risks. Learn more by reading this flyer. Vaccines: The Safest Thing in Medicine: Have you ever wondered where vaccines come from? What Better Way To Spend The Day Than Preventing Disease? Click here for an article and video about vaccine effectiveness and safety.